A well-furnished and well equipped clean bathroom is the ultimate need of us. Though the bathroom is a place of getting refreshed, there are huge examples of mishaps occurred here. To avoid a sudden fall or slip on the floor there is no alternative of a shower grab bar on the wall. Under this circumstances, you have to choose the best shower grab bar for your bathroom. The Safe-er-Grip Bathtub & Shower Handle is the expected bathroom grip bar for the one with the need for more confidence and helps to keep balance getting in or out of the tub or shower. It gives the whole family steady confidence in and around the bathtub. This grab bar provides the supreme flexibility of positioning and placement because it is easy to attach and remove without using any tools. Only a single press on the tab levers is enough to finish the job of attachment. During installation, you will have to apply pressure on the handle to flip the latches down and slide fingertip under the rubber seal at each end to release suction. The negative side of it is, it is not applicable in the case of the person who needs to give his/her full body weight to pull themselves up. A traditional permanent wall-grab bar provides the utmost safety of holding full weight whether this one cannot do it. The suction cup is only applicable to smooth, flat, non-permeable surfaces. It cannot cover grout lines and will not work on textured surfaces. Tiles should be 4’x4’ or greater. It is must to reattach before each use. Having some silly negative aspects, Changing Lifestyles Safe-er-Grip is the best shower grip bar in the market. Moen 24-Inch Grab Bar provides the feeling of security and calmness in the bathroom. It is perfectly usable in the bathtub, shower or toilet. It can hold up to 500 pounds at a time. It is 24 inches by 36 inches and has a 1.5-inch diameter which can accommodate every size of hands. 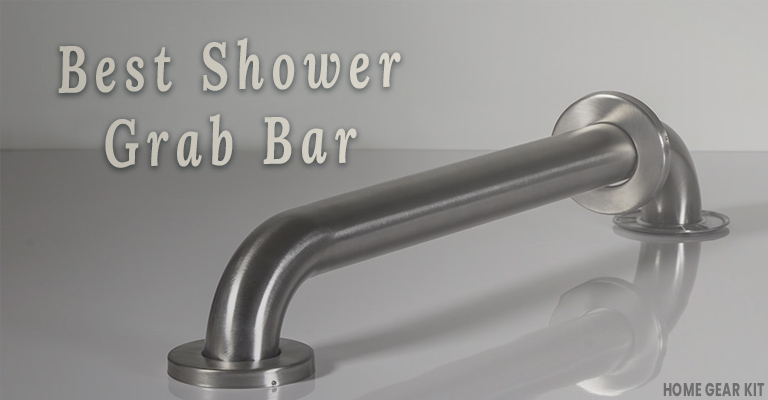 It is one of the best shower grab bar among the permanent grab bars of the market. The stainless steel construction makes it durable as well as strong and reliable. It is stylish too. The covers to the opposite ends conceal the installing hard wears to provide the neat and seamless look. The Secure Mount Anchors makes it easy to install strongly at any angle. It is easy to install in all places smooth and textured surface. This ADA compliant grab bar has an elegant look of lightly brushed warm grey metallic colour. You will never feel insecure to hold it. Getting out of the bathroom or toilet and after standing up holding Moen 24-Inch Grab Bar you will feel complete satisfaction. It provides Lifetime Warranty which has lifted it to the highest lasting performance and complements of bathroom decor. Are you worried about your mother and child of falling down on the bathroom or toilet floor? Then Vive Suction Grab Bar is the solution to it. It is one of the best shower grab bars having some exceptional features, such as indicator light. The strong suction cup makes it usable on any non-porous and flat surface; including tile, glass, acrylic, and fiberglass. It can hold up to 300 pounds, for which it provides extreme stability in the time of entering and exiting the shower or the tub or the toilet. Green = The bar is ready to use and successfully installed. Red= the installation is not ok or airtight. This mechanism provides the highest safety and security. But it is must taste before buying whether the indicator works or not. Lifting the tabs allow you to change the position anywhere smoothly. Moreover, you may carry it during traveling. Even if you use it properly it will not harm the surface. The Comfortable Non Slip Grip is ensured by the textured and contoured rubber which is perfect for our elderly, children and sick. For extra security, there are molded finger grips under-side the handle. There is about 3.25” leaving ample room for grasping the bar with your finger. In a word, it is the most comfortable and reliable grab bar. It has a 60-day warranty. It is only meant to add stability not to support your entire body-weight. It can be applied to a flat, non-porous surface and cannot be applied over any grout lines. Moreover, it should be removed and re-applied once in a week to ensure the proper installation. Are you leaving your parents at home alone and that’s why feeling insecure whether they would be safe in the bathroom or toilet? No more tension!!! Jumbl has brought a super comfortable and reliable Bath and Shower Suction Cup Grab Bar for you. Jumbl Bath and Shower Suction Cup Grab Bar has a strong suction technology in which, it is much easier than before to attach and remove. A simple tab lever is enough to do the job of installation and removal. No external equipment is necessary here. Rubber Suction Cup Material has made it perfect for a tight grip in a smooth, wet and slippery surface. Non-porous tile, glass, ceramic etc are applicable for this grab bar. Its 17” length is enough to cover a large area to capture every height. The grab bar is not a thing to release full weight, but an assistant to help you to ensure an easy access or out of the shower or toilet or bath. Before using it, it is just to check whether it has been installed rightly. It is also must to taste the secure installation once a week. This grab bar is a permanent solution or not to drill your favorite wall. Moreover, you will remain in a peaceful mind finding your family members from age-old, young and kids. Everything has its own demerits. Jumbl Bath and Shower Suction Cup Grab Bar is not applicable in any non-smooth surface. It is also less durable than the permanent grab bar. But overall, this is the best shower grab bar in the market. If you are over-weight and have a huge possibility of falling during shower time or taking bath in the bathtub or sitting for the toilet; then Moen R8918 18-Inch Bathroom Grab Bar can be the best solution for you to avoid an accident. This ADA grab bar can hold up to 500 pounds. The product is 100% stainless steel and the size is 18” in length and 1.5” in diameter. The Secure Mount design makes it easier to install the bar securely and neatly. No screw will be visible to maintain the style, seamlessness, and cleanliness. If you lose or damage the anchor anyhow, you can buy another one. The secure mount anchor is available in the market to buy separately. Among the permanent grab bars in the market, this is good enough to give you the lifetime warranty. It is applicable on every surface including a textured one. It is at a time- durable, reliable and stylish. As it is permanently installed, there is no matter of checking every week. Your family will be secured for the lifetime. Mammies and daddies are facing a big deal in handling their toddlers in the shower and in the bathtub. Their restlessness may cause sudden mishap of falling on the bathroom floor. 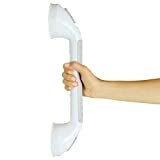 Changing Lifestyles Safe-er-Grip is one of the best shower grab bars which will help parents and their toddlers to keep balance on wet and slippery bathroom or bathtub. It is easy to install and remove for its single pressure on the tab. But before it the assurance of smooth and non-porous surface is necessary. It will not be applicable to drywall. The tiles should be 4” * 4” or greater. Releasing the bar from the surface is much easier than attaching. Just a release of the laches of both sides can do it. Slight fingertip on the rubber seal will release the suction of the two opposite end. It looks aristocratic. The color is white with gray accents. The supreme flexibility of positioning is its highest positivity. You may use it in your travel. It is attachable without any tool. And not heavy to carry in the bag. But you must check it before using, because if it is not attached properly, any type of accident may occur, like- falling down and bone fracture. It should check and recheck again and again, if necessary should be reinstalled. We all have to remember it is not our body weight leverage, it’s our balance assistant. When safety and sophistication go together nothing can be better than that. Franklin Brass 5616 Shower Grab Bar is an example of it. It has exceeded ADA and ASTM standards in every single aspect. It assures additional security and peace in mind. Where there is less chance of accident peace dwells there. 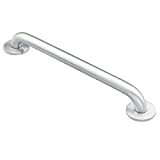 The grab bar is made of stainless steel having multiple finishing. It is strong and quality steel. So gives a lifetime warranty. The outer hardware is concealed in the concealed covering. This concealed mount gives a clean and seamless look of the bathroom environment. There is no chance of tearing apart of our clothes by the screw also. It can hold 500 pounds at a time. There are enough sizes to fulfill your necessity. To grip perfectly, 1-1/4″ bar diameter allows enough space to you. It is usable both wet and dry walls, textured or smooth but lacks moving facility. The flexibility of placing is absent here. You have to fix it for the lifetime. It is your faithful guard to give you a sense of security in the shower room or the toilet. Without sacrificing aristocracy, it is able to do its job with full gear. So Franklin Brass 5616 Shower Grab Bar can be your perfect choice. provides safety, comfort, and peace in mind at a time. It is one of the best shower grab bars which is not for use on tiles. It works on complete dry and flat surface. It is a faithful assistant in the bathroom far a secure enter and exit. It maintains stability and balance. On the other hand, opening the tab to detach the bar. The process creates no damage to the surface and needs no physical effort. The main ingredient is corrosion-resistant plastic, which provides more comfort and it is more durable. The gentle and molded contoured grip works as the extra comforter and the curvature of the handle design which is white in color secure a firmness in holding. This 12” grip bar is enough to hold easily and comfortably. 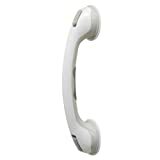 Moen LR2308W Assist Bath Grip is durable, reliable and stylish. It is easy to port. You may put it in your luggage and travel to far. It gives you a lifetime satisfaction. In a word, it is the real security provider of your family in the bathroom or toilet. Not merely buying but buying the best thing is our goal. There are lots of manufacturers who are producing different types of bathroom accessories throughout the world. Grab bars are available in many styles. Manufacturers have begun to understand the need to match with home decor and producing grab bars of a different fashion. But all of them are not up to the mark. We should be very careful while buying a grab bar. The first thing we should consider is the production material. If it is a metal grab bar, then it must be stainless steel. On the other hand, if it is plastic, then it should be corrosion-resistant plastic. It is must taste before buying whether the indicator works or not. The holder should be non-slip. Corrosion-resistant plastic ensures the comfort and at a time gripping too. The standard of the capacity is 500 pound. So we should be careful during buying. We should choose the product having lifetime durability. These are stronger than the average. Product must be ADA compliant. It will be safe for us. The length should be 24” which can hold maximum weight. There must be at least 1½ inch (38 mm) clearance from the wall. Also, you should care of easy installing feature. In addition to straight grab bars, there are fold-out bars, L-shaped, U-shaped, and corner grab bars. Grab bars are also made with LED lighting and can come in many different colors. We should buy according to our necessity. In the case of a secure mount grab bar, there should be a concealing anchor to hide the screws and to give a seamless look. If you use grab bar as a safety device in order to prevent falls, your best choice would be a horizontal bar. Scientific research has found that in a fall situation, gripping strength is far greater using a horizontal bar than a vertical bar. So, the horizontal grab bar is the safest choice. Shower Grab bar is a safety device aimed to enable a person to keep balance, lessen fatigue while standing, hold some of their weight while movement, or have something to grab onto in case of a slip or fall in the bathroom. The first and most important necessity of a grab bar is to ensure the safety in the bathroom environment. It prevents accidents during bathing and shower. The old, sick and children feel a sense of security holding a grab bar. Falling down the bathroom floor or bathtub is a common phenomenon of our daily life. A grab bar can help us to keep balance. Elders and tired or sick people face difficulties in standing from the seat and bathtub. To lessen their fatigue a grab bar is necessary. Those who are over-weighted can make their standing easy through a grab bar. When safety is ensured peace comes easily. Grab gar can ensure the security and so it is a peace giver. The names above are different types of grab bars which is used in different types of activity and situation. The details of them are available on this website. In the case of shower suction cup bar, we should check it before buying whether the suction works well or not. If there is an indicator, it is must to check before buying. After installation, we should check again and again before using. If necessary, it should re-install carefully once in a week. A grab bar is not for holding full body weight, it just helps to keep balance. To increase the safety and independence of an individual is the reason for installing grab in the bathroom while getting in and out of a shower or bathtub or on and off the toilet. It also helps us to keep balance during sitting down and standing up from a couch or chair, getting in and out of bed or stepping up and down a step. It is one of our fundamental things among other domestic items. So we should be more careful in choosing the best shower grab bar from the hundreds of bars in the market.